You don’t need a garage full of cleaners to have a clean car! CarPro MultiX All Purpose Cleaner Concentrate was designed as a versatile and effective “Jack of all trades” cleaner. The powerful cleaner agents contained in CarPro MultiX All Purpose Cleaner Concentrate are capable of handling any mess; spanning from light soil on your windshield, all the way to the heavy grime on your tires and engine bay. CarPro MultiX All Purpose Cleaner Concentrate will save you a ton of money thanks to its high concentration ratios and the fact that you won’t have to buy a separate cleaner for each surface of your vehicle. There are so many different types of surfaces and contamination that your car is exposed to that it can be quite cumbersome to keep up with all the different recommended products to care for them. There are different products recommended for glass, paint, metal, plastic, and any other surface you can think of. Additionally, a cleaner that is designed for cleaning the dust off your dash won’t do anything to the road grime on your wheels and trim. CarPro MultiX All Purpose Cleaner Concentrate, on the other hand, was designed to address pretty much every possible mess your car will ever experience. CarPro MultiX All Purpose Cleaner Concentrate was designed using advance cleaner agents that are incredibly effective at tackling stubborn messes. This means that when you are looking to breakdown the oily residue that has collect on your engine bay, CarPro MultiX All Purpose Cleaner Concentrate will take care of it in minutes. After diluting to your desired strenght, the CarPro Multi X can be used to clean virtually ANY surface! If, however, you are working on the delicate carpeting in your interior, a stronger cleaner might damage the fibers and permanently discolor the carpet. CarPro MultiX All Purpose Cleaner Concentrate is still the answer to your problem though! CarPro MultiX All Purpose Cleaner Concentrate can be diluted to many different ratios. When you dilute it, the effective cleaner agents are still there, but there is less of them. So, the cleaner is still quite effective, but there isn’t any risk to your carpet now that CarPro MultiX All Purpose Cleaner Concentrate is properly diluted! 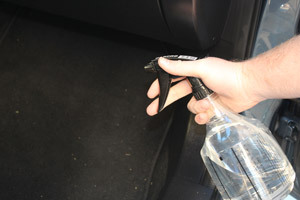 As detailers, we tend to spend an enormous amount of money on keeping our car clean. So much so, in fact, that we often have so many bottles in our garage that we are unable to park our car in it! CarPro MultiX All Purpose Cleaner Concentrate cuts down on this drastically by storing all your cleaners in one bottle! Just simply dilute CarPro MultiX All Purpose Cleaner Concentrate to match the mess and surface, and you are on your way to a perfectly clean surface! Always be sure to test CarPro MultiX All Purpose Cleaner Concentrate on an inconspicuous area before each use.